Proper food safety tips and techniques reduce confusion and reinforce good habits. There’s more to food safety than meets the eye. From your supply chain to employee hygiene practices, every step your food takes from the field to the plate is crucial to preventing foodborne illness. It’s no secret that an outbreak can severely damage a successful brand, so keeping up to date on the latest food safety information is crucial to maintaining your image in today’s marketplace. 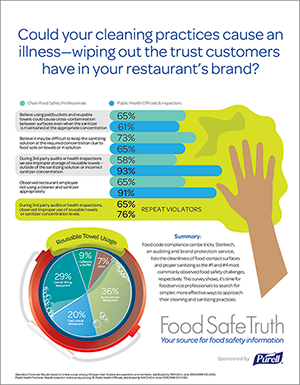 Could your cleaning practices cause an illness—wiping out the trust customers have in your restaurant’s brand? Improper use of sanitizers and cleaning equipment can be a key contributor to cross-contamination – and ultimately – foodborne illness outbreaks. Reusable towels and commonly used cleaners and sanitizers can be effective, but when they’re not used properly, pathogens not only survive the cleaning process, they can also move between surfaces and spread throughout your restaurant. Navigating the Landscape to Select the Right Surface Sanitizer. Product safety, efficacy and sustainability are important to consider when developing a surface sanitizing and cleaning program. Find out what to consider when seeking the right fit for surface sanitizing and cleaning in an ever-changing landscape of products and requirements. Where Do We Go From Here? A Look at Food Safety in the Food Service Industry Today. This scientific bulletin takes a closer look at the challenges facing the foodservice industry, ways to overcome these challenges and best practices for a sound food safety program. Know your food safety risks and implement good practices. Besides hand washing, what else can you do to maintain food safety in your restaurant? It's important to have a comprehensive plan in place that fosters a culture of foodservice safety. Dave Shumaker, Microbiologist. Does water temperature really matter in hand washing? In some schools of thought, the hotter the water means the better the germ kill. Dave Shumaker, Microbiologist, sets the record straight. When are restaurant employees required to wear gloves? Dave Shumaker, Microbiologist, informs about gloving requirements according to the U. S. Food and Drug Administration (FDA) Model Food Code. Why is good hand hygiene so important? David Macinga, Ph.D. tells why hand hygiene is important in preventing the spread of germs. What are the facts about superbugs and germ transmission? Setting the record straight about hand sanitizers and supergerms, David Macinga, Ph.D. explains how alcohol works on bacteria and the spread of germs. What are the facts about hand sanitizers and triclosan? James W. Arbogast, Ph. D. states the safety in using an alcohol-based hand sanitizer rather than triclosan, which does not meet FDA regulations for safety and efficacy in leave on products such as hand sanitizers. Setting the record straight about hand sanitizers. James W. Arbogast, Ph.D. addresses 7 common myths about hand sanitizers. Myth #1: "Using Hand Sanitizer Creates Antibiotic Resistance"
Myth #3: "All Germs Are the Same"
Myth #5: "Alcohol and Non Alcohol-Based Hand Sanitizers are the Same"
Myth #7: "Frequent Use of Hand Sanitizers Dries Out My Hands"
Myth #2: "Hand Sanitizers Create Supergerms"
Myth #4: "Using Hand Sanitizer Kills All of the Germs, Even the Good Germs"
Myth #6: "Hand Sanitizers Contain Triclosan, Which is Found in Antibacterial Soaps"
Germs can spread like wildfire in a foodservice setting if the proper measures aren’t taken. From employee hygiene to monitoring your supply chain, it’s imperative to establish – and maintain – food safety protocols to keep both employees and customers safe. Clean surfaces, fresh food kept at temperature and knowledgeable employees are all great ways to help prevent an outbreak. Everyone knows how important food safety is to the restaurant business, but did you know there are more than 250 different types of foodborne illnesses? That means outbreaks are much more common than you may think. Employee hygiene is critical to maintaining high food safety standards, and keeping up with handwashing, sanitizing and gloving habits is essential to helping reduce the chances of an outbreak. In the wake of the Food Safety Modernization Act (FSMA), food safety experts are emphasizing a shift in thinking from reacting to an outbreak after it happens, to preventing one before it happens. Keeping food items safe, maintaining cleanliness standards in your facility, and keeping employees accountable for their own hygiene are all important ways to help prevent an outbreak. Cooking foods to the proper temperature is a fundamental of restaurant operation. By making sure that minimum temperatures are met and maintained, operators can greatly reduce the risk of foodborne illness after food has been prepared. Knowing and observing these guidelines isn’t just a good idea – in many cases, it’s also the law. Knowing every aspect of your food’s origins, sources and preparation is a key way to help reduce the risk of a foodborne illness outbreak. After all, when the food comes in to your facility, it’s already seen up to half its lifespan in the market. By monitoring where your food comes from and who’s transporting it – among other things – you can stay ahead of the foodborne illness curve. According to a 2015 Centers for Disease Control and Prevention (CDC) report, there has been a rise in multistate foodborne illness-related outbreaks. Based on these numbers, it is evident that now is the time to re-evaluate current food safety practices to ensure foodservice establishments are doing everything they can to mitigate the risk of foodborne illness, which can be incredibly costly to both their bottom line and reputation. In this article published in the August/September 2016 issue of Food Quality & Safety, learn about the key components that go into building a strong food safety program. A new rule, proposed in February of 2014, has been finalized by the U.S. Food and Drug Administration (FDA) to help reduce the number of foodborne illnesses in our food chain. A part of a larger effort to emphasize prevention of such outbreaks, the new rule implements the Sanitary Food Transportation Act of 2005. This ruling applies to all food transported by motor or rail vehicle, as well as all shippers, loaders, carriers and receivers of said food. The Food Safety Modernization Act (FSMA) of 2011 has been a critical step toward better food safety practices. But as policies and priorities change, how can you be sure you’re operating as efficiently as possible and not violating the new FSMA rules? Proactively managing hazards and mitigating risk factors, along with testing your supply chain can help reduce the chances of an outbreak, and keep your business running smoothly. Managing risk is an important part of any CEO’s job description. And for a foodservice business, managing risk comes in the form of preventing foodborne illness. Proper hand hygiene throughout the supply chain can help to mitigate that risk, and create a higher quality product in the end. In a world where so many things are out of your control, hand hygiene is a simple, effective way to help prevent illness. Every step of the way, the food you serve can make or break your business. Making sure everything from produce to protein is clean and safe for customers is the most important part of the restaurant supply chain. Using the proper techniques and processes when sourcing ingredients, receiving shipments, storing food, marking expiration dates – even growing food yourself – can help reduce the chance of your customers eating contaminated food. One of the most common causes of foodborne illness is poor hand hygiene. Every step of the way – from field to plate – involves human contact, and keeping workers’ hands clean is an extremely effective way to help reduce the risk of an outbreak. Instituting a strict hand hygiene program and adhering to it can help keep both workers and restaurant guests safe from foodborne illnesses. By using an effective hand hygiene program, you can be sure you’re adhering to NSF compliance standards. Technology can play a huge role in food safety. Case in point, iCertainty and Zebra Technologies Corporation recently announced a mobile food safety solution that leverages Disney parks’ safety technology and best practices to maintain food safety standards and records. The departure from a laborious, paper-based system means faster tracking, more standardization and a better customer experience. Clean hands can help reduce the chance of spreading foodborne illness, and using a hand hygiene regimen that includes washing with soap and water, followed by an alcohol-based hand sanitizer is more effective at reducing transient microorganisms on hands. Additionally, touch-free soap and sanitizer dispensers can further reduce the risk by eliminating the need to manually operate dispensers. Many touch-free dispensers also use sealed refills, which prevent contamination. From proper food safety practices to gloving procedures, employees are on the front lines of food safety. In addition to handling food properly, employee hygiene is essential to preventing an outbreak of foodborne illness. Communicating hand hygiene standards effectively can help employees not only use proper handwashing techniques, it can also eliminate misunderstandings about what techniques are effective and which are not. With the recent passing of the Food Safety Modernization Act, restaurants and suppliers alike are dealing with changes to the industry. In the interest of customer safety and foodborne illness prevention, more and more restaurants are looking to create transparency in their supply chains – not only to appeal to customers’ requests for openness, but also to help track the source of an outbreak, should one occur. Along with being dangerous and unhealthy for consumers, foodborne illnesses are a serious burden on public health – particularly the costs associated with healthcare. Foodborne illnesses are preventable and often underreported, which makes it difficult to track and report these outbreaks. Physical, social and economic challenges exist for consumers, suppliers and restaurants alike, and communication, hard work and understanding can go a long way to change food safety behavior for the better. Foodborne illness doesn’t always come from food. Increasingly, sick employees are causing illness in customers, simply by coming to work while displaying symptoms. It’s difficult enough to maintain a healthy supply chain and a clean restaurant, and without the proper protocols, even if you’re doing everything else right, you can still be contributing to an outbreak. Implementing a sick employee policy, monitoring employees’ well-being and maintaining hygiene standards for staff can greatly reduce the chances of an outbreak from a sick employee. Each year, one in six Americans will fall ill with one of the over 250 known foodborne illnesses. And while the list of these pathogens is lengthy, there are only a handful of these illnesses that commonly affect people. Norovirus and Salmonella are two of the most common foodborne illnesses, and while they can spread quickly, common-sense food safety practices are a very effective way to curtail these outbreaks. From the supply chain to the table, the foodservice industry is tasked with not only feeding customers, but also keeping them safe from foodborne illness. And while there are processes, protocols, technology and legislation to ensure that customers are protected, cultural norms can be detrimental to food safety practices. By creating a strong food safety culture, we can begin to close the gap and work toward a safer foodservice industry. For any restaurant, a foodborne illness outbreak can spell disaster. So before an outbreak can occur, be sure your facility is taking the proper precautions to prevent contaminated food from making its way on to a patron’s plate. By using approved suppliers, having a clear food safety policy and keeping your facility clean, among other best practices, you can avoid the PR nightmare of an outbreak. During a recent workshop in Las Vegas, attendees discussed – and agreed upon – the importance of hand washing in food service environments. Members took on the Norovirus challenge, working to eliminate biofilms and test data-driven hand washing systems. Presenters and attendees found that using hand washing data was extremely effective in dispelling hand hygiene myths, and creating accountability for restaurant staff and management. In a recent town hall meeting of industry leaders, it was agreed that 2016 was a tipping point for food safety. Recent advances in tracking, genome sequencing and transportation technology, along with a more stringent regulatory environment have created an atmosphere of change in the foodservice industry, but many agree that the remaining gaps must continue to close if we’re to change the industry for the better. What Can Cruise Lines Teach the Restaurant Industry? Are Your Employees Increasing Your Risk for Norovirus? Why Do We Need Spill Kits? Avoiding Cross-Contamination: It’s All About the Details.